Ceilingfancapacitors.net is a company that stocks over 100 different ceiling fan capacitors. We carry 2, 3, 4, 5, and 6 wire capacitors for ceiling fans. The style for most of our capacitors will be CBB61. This ceiling fan capacitor is rectangular and black in color. This style is also used in some desk fans, stand fans, exhaust fans, ventilator fans, etc. The 2 wire ceiling fan capacitor is normally used as a start capacitor. The 3 wire is normally used to control the speeds of the fan. The 4 wire fan capacitor is normally used as a combo, start and speed, but can be for speed only. The 5 wire and 6 wire will normally be used for both start and speed on the ceiling fan. Ceiling fans are designed to operate using SPECIFIC capacitor combinations. 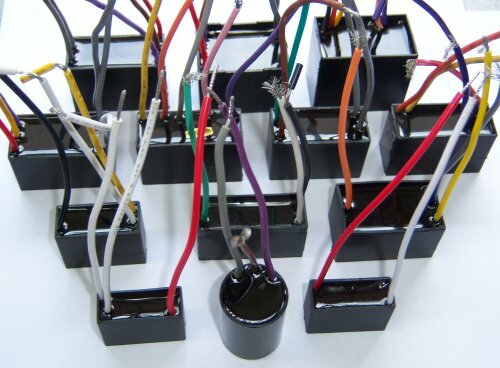 Each capacitor has a uf rating and is designed for that specific fan. Motor size, blade pitch and blade length are used to determine the correct rating combination for that specific ceiling fan. So when replacing a ceiling fan capacitor, you should always try to match the ratings exactly. We stock ceiling fan capacitors for all the following brands: Casablanca, Hunter, Hampton Bay, Harbor Breeze, Minka Aire, Regency, Craftmade and most others. We have been selling ceiling fan parts for over 18 years. When buying a replacement ceiling fan capacitor, quality should be very important. The quality of capacitors can vary widely. Prices for fan capacitors from different manufacturers or distributors can be very different. So how do you determine the quality of a product? Ask about the warranty. All our ceiling fan capacitors come with a lifetime guarantee.